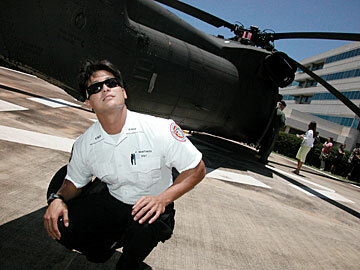 Emergency medical technician Justin Santiago looks over a Black Hawk helicopter at St. Francis Medical Center West. The Army has used the transports as a training exercise, but they will soon be needed for summer deployment to Iraq. Army helicopters that have flown severe medical emergencies to Oahu hospitals for 32 years are being deployed to Iraq and will no longer be available as of April 1. The 12 Black Hawk helicopters equipped for medevac use will have to start training for the summer deployment to Iraq and will be unavailable until at least October of next year, Lt. Col. John Williams, a spokesman for the U.S. Army Pacific, said yesterday. Oahu's emergency medical service community has known that this day could come "from the day we went to war," Robert Pedro, a supervisor for the city's Emergency Medical Services, said yesterday. "They (the Army) has been telling us they could go anytime." "We've been thinking about it, talking about how we could find an alternate or go without" the helicopter transport, Pedro said. Now that there's a deadline, state and city Emergency Medical Services, hospitals and private emergency medical providers will have to sit down and figure out what to do, Pedro said. Between 1974 and 2004, the Army saved Oahu taxpayers an estimated $91 million by transporting 7,000 patients on 6,000 emergency medical flights, Williams said an Army study shows. The military used the transports as a training exercise for its soldiers -- and people with life-threatening injuries got to the hospital -- fast. "We utilize them everyday for rural areas," Pedro said. "By helicopter it's 12 minutes to Queen's. By ground it can be 45 minutes to an hour, depending on traffic." The Army's hiatus from the work "is a high concern and an issue that's being discussed by many different committees," said Janice Okubo, state Department of Health spokeswoman. "THE MAST (Military Assistance to Safety and Traffic) is and has been the only medevac helicopter on Oahu. There is no backup at this time," Okubo said. Among the possibilities being discussed are whether the state might purchase a helicopter, she said. Until a new system is in place, Pedro said, "if we have a trauma out in the rural area, we'll have to transport by ground." Pedro said the most common origin of medevac flights are Kahuku and Waianae. And the most common destination is the trauma center at Queen's Medical Center. Another use of the medevac flights is getting newborn babies with serious problems to Kapiolani Hospital for Women and Children quickly -- via the helipad at Kuakini Hospital and a short ground transport, Pedro said. The Honolulu Fire Department's helicopters are too small for the job. "Our helicopters are for rescue in mountain and water areas," said Fire Capt. Emmit Kane. The Hawaii National Guard doesn't have the same capacity as the regular Army to staff medevac helicopters, Guard spokesman Maj. Chuck Anthony told KITV News yesterday. However, he said, "We'll do whatever we can, whenever we can." Hawaii is actually one of the few states that still relies on the military for patient transport, Williams said. "The majority of states now use civilian contractors."